Hundreds of flights at Bristol Airport were cancelled on Friday due to heavy snowfall. As the West Country wakes up to snow we've got the latest on the travel and school closures. The BMI flight skidded off the runway while landing at Bristol Airport, coming to a halt after travelling 120 metres along grass. 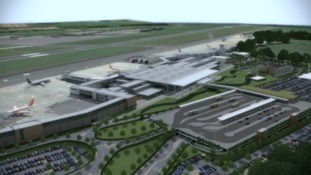 Bristol Airport has submitted a planning application which could see 12 million passengers travel through the port a year by mid 2020s. Bristol Airport's annual Santa Flight took to the skies this week and our reporter Ellie Pitt was there. TUI pilot lands plane sideways at Bristol Airport during Storm Callum in what has been described as an 'impressive landing'. Bristol Airport managers say live flight information has been restored to digital screens in key locations following a cyber attack. Bristol Airport say they are working to reopen the runway in a bid to allow flights that have not already been cancelled to go ahead today.